From a Kurdish wedding in Iran, to the destroyed Kurdish countryside in southeastern Turkey, to lunch with a powerful exiled agha in Syria, to the sites of Saddam Hussein's horrific chemical attacks in Iraq, Bird offers welcome insight into a violently stunning world seen by few Westerners--and understood by fewer. Part mesmerizing travelogue, part action-packed history, part reportage, and part cultural study, this critical book helps to unveil the mysteries of an unknown but increasingly influential part of the world. 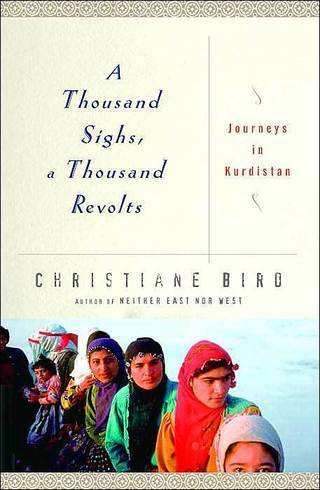 "Bird has brought keen observation, great personal courage, and an obviously empathetic personality to the story of her adventures among the Kurds.... She enlightens us and also gives us a great gift--a sense of the humanity and pride of a beguiling people." "A travel writer's anabasis through a country that is no country.... Impressive reportage, a fearless commitment to seeing what there is to see, and a strong sense of history: a fine work of literary travel, one that honors its subjects." "In a fascinating narrative, Bird meticulously unveils a fractured, male-dominated society haunted by centuries of despair." "[A] brilliantly evocative portrait of people who have suffered terrible crimes, but endured, with remarkable courage and charm and undying hope, captured with rare sensitivity and sympathetic understanding." "Christiane Bird covers as much ground as she can, listening to everyone who comes her way and filling in the historical background of every place she can with admirable clarity." "[Bird's] work is stunning, revelatory, and important." "Bird brings depth of knowledge, sensitivity and just plain courage to her pilgrimages." "This book is the best available introduction to the Kurds...Staying with Kurdish families, the author never missed an opportunity to meet one more young dreamer, aging tribal chief, political activist or victim of regime violence." "The Kurds often say that they have no friends but the mountains. Read this book and you will understand why in Iraq the Americans need to give the Kurds another friend." "One of Christiane Bird's revelations in A Thousand Sighs, a Thousand Revolts is that in the Middle East, one should never confuse minority with marginality. This account by a particularly attentive American women journeying into the land of the Kurds helps readers understand the most striking feature of the Middle East: complexity." "Christiane Bird writes with an open mind, an eye for detail, and a clear voice. No one who wishes to be informed on what is going on in the world can afford to skip this important book about a little known and often abused people." From the moment I arrived in Kurdistan, I felt as if I had fallen through the back door of the world and into a tragic magic kingdom--the kind of place where tyrants' castles reigned over mist-filled valleys, beautiful damsels ran away with doomed princes, and ten-foot-tall heroes battled scaly green dragons as good clashed swords with evil. In reality, there was no kingdom--at least not of the type found in fairy tales--but I did find evil, as well as good, and castles and valleys, damsels and princes, magic and tragedy.